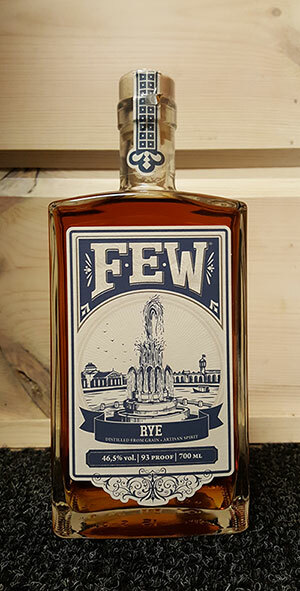 FEW Rye Whiskey is a 3 year old, 70% rye from a young American craft distillery by FEW Spirits. Established in 2011 just outside Chicago (Evanston, Illinois) by Paul Hletko, FEW distillery makes American gin, white whiskey, bourbon and rye whiskey. They’ve already managed to produce award-winning gins and whiskies. Every step of the production from grain to glass is done by them, with as local ingredients to the distillery as possible. FEW takes its name from the initials of Frances Elizabeth Willard, who had a big influence in the temperance movement as the president of Women’s Christian Temperance Union. It all started in Evanston, so the location of FEW Spirits is the home of prohibition. Ironically, Evanston is nowadays a home to excellent craft distilling. And this irony has been taken into account in a cheeky way. Usually I prefer my rye whiskeys with a major proportion of rye. The ones with 90% or over. I really like when the rye grain stands out, with other ingredients completing the palate of course. 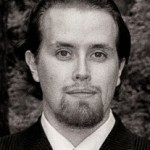 Even though FEW Rye Whiskey has an ample proportion of rye in its mash bill, I love it. They’ve managed to get the rye stand out in a fresh way, even though the notes are quite light. This dram is as refreshing as you can get. Apparently it makes a good Manhattan drink, haven’t tried it myself but it’s easy to believe because FEW Rye is so fresh. Fresh rye whiskey is a great base for a cocktail. I could imagine sipping this whiskey somewhere in Manhattan. In a light, witty Woody Allen movie setting. Nose: Marriage with corn really shows in the aromas. Corn and cherry notes along with sweet apples. Drops of water brings wee smoky and spicy notes into the fruity mix. Taste: Juicy and fruity. 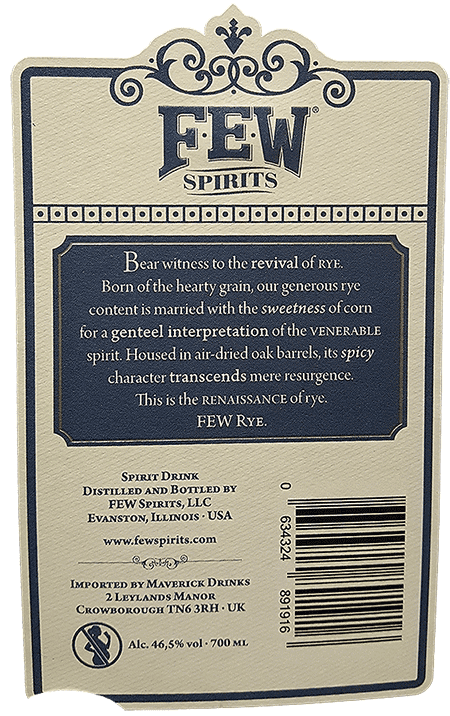 Rye is definitely there but in a light, bit grainy, very fruity way. Citrus notes dominate, baking soda and pears. Addition of water balances the palate – makes it a mellow juicy fruit rye pack. Finish: Very crispy with rye and fruit notes. Baking soda again, this time it’s dominating till the very end. Drops of water makes the rye notes stand out. Balance: Lively, light yet characteristic, even quite rich. First impressions weren’t so good but I’ve learned to like this rye whiskey a lot. Tropical rye dram!